OT Xmas - Festive template specifically designed for shops. Template combines a variety of colors of black, red and green. The unique location of the goods with a clean and elegant design template, making it versatile for shops with any theme, and it is the fashion, electronics, accessories, gadgets, etc. 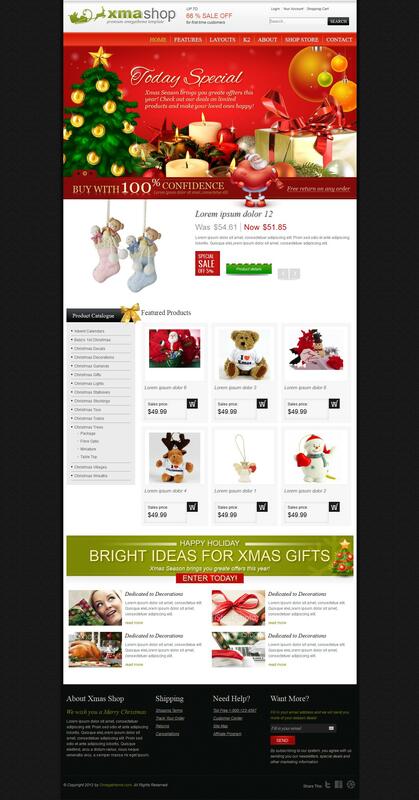 OT Xmas runs on the latest version of the popular online shopping component - Virtuemart2. In the template manager adds support for content management K2, which significantly increases the possibilities and potential template. Solid Framework proprietary platform provides fast download speeds and ease of customization of appearance. Supports all modern browsers and mobile screens.